As penance for my recent foray into non-seasonal vegetables, I went all out with local produce this weekend. Actually, I am trying to clear my stash of storage vegetables before spring. Every year at this time, I find myself with lingering winter squash, sweet potatoes and turnips, as well as onions and garlic that are starting to sprout, and ginger root still growing in a pot. 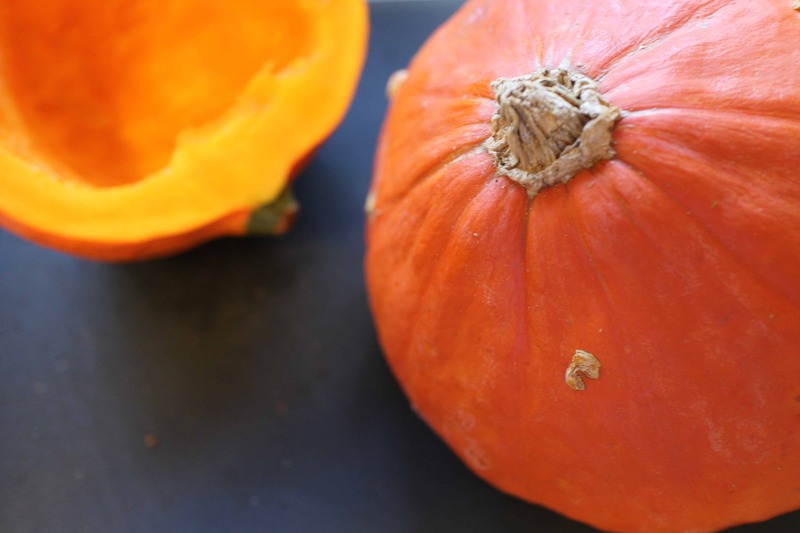 Typically cheese pumpkins and blue hubbard squash are the lingerers but this year it’s red kuri squash, which is sometimes called Hokkaido squash or, in French, potimarron. Its flesh is dark orange and its flavor deep, even after it’s been stored for a couple of months. We grew these last year and they’re my new favorite. I halved the squash, saved the seeds of course, and roasted it cut side down in a 350-degree oven until soft, about an hour. Once cooled, I scooped out the flesh and stored it in the refrigerator for all kinds of uses: soup, risotto, even pancakes. 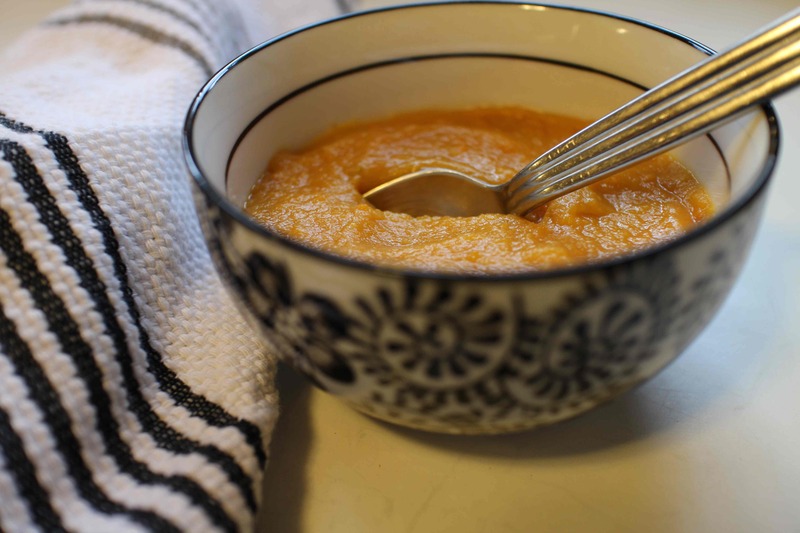 I like this simplest of all soups, thick like puree, creamy from the addition of sweet potato, and very flavorful from the richness of the squash and the abundance of ginger. Of course, you could make it creamier with the addition of coconut milk or garnish it with nuts or seeds, but it was perfect as is. To prepare the squash, wash and halve it, and scoop out the seeds. Sprinkle the cavity with olive oil and salt and place the squash, cut side down, on a baking sheet. Bake in a preheated 350-degree oven for about an hour or until very soft. Let the squash cool and scoop out the flesh. You can make this ahead of time. To prepare the soup, slowly sauté the onion in a neutral vegetable oil such as canola until it softens. Add the ginger and stir until the ginger turns aromatic. Add the sweet potato and a couple of cups of vegetable stock or water or a combination. Bring to a boil, turn down the heat, and simmer, covered, until the sweet potato is tender, about 15 minutes. Add the roasted squash, additional liquid if needed, and cook for another 15 minutes, covered. Puree the mixture with an immersion blender or in a food processor. Adjust the seasonings and add more liquid if needed, including the optional coconut milk just before serving.